Now that I’m feverishly working away at getting Spoonfed up and running I must be very strategic about my time. With a full-time work week in the mix it means I must be a Weekend Warrior! Since we still need to fit things in like clean the house, walk the dog, do the laundry and do the groceries also on the weekend, we’ve decided to get up first thing Saturday morning and do as Mark Twain and Brian Tracy did, “Eat that Frog”. O.K. so get up and get cleaning bathrooms I shall, while hubby gets up and gets to the laundry room. There are plenty of frogs to eat in this house. Now for the fun part! Let’s bake some healthy treats for our older babies of 12 months +…and to be frank…for us ‘cause they’re so darn tasty. 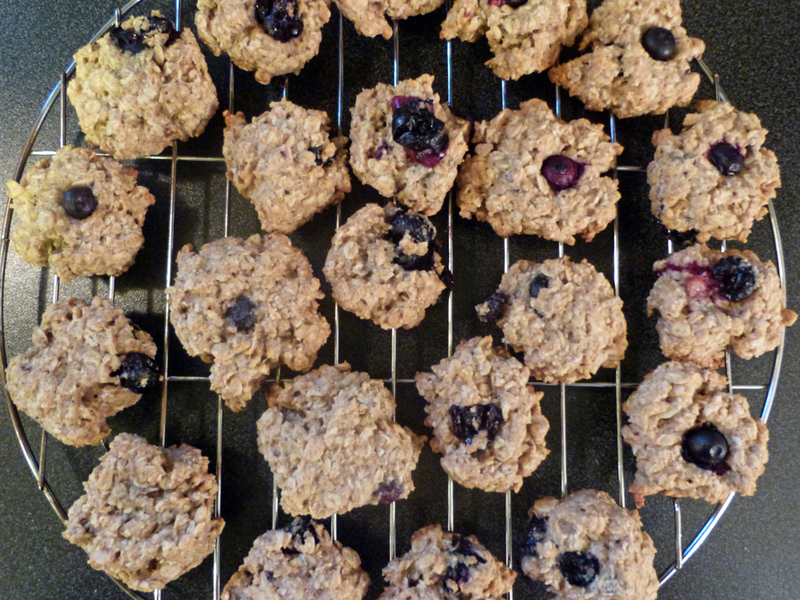 This is a great little oatmeal style cookie/cake that is sweetened naturally with the fruit and honey that we put in them rather than the loads of refined sugar that we don’t. It’s best to wait until baby is 12 months+ for this recipe because we use honey which may be unsafe for babies under 12 months. Health Canada recommends waiting until baby is at least 12 months because at that age they have developed helpful bacteria in their intestines that protect them against the bacteria spores that can grow and produce toxins leading to infant botulism. Although infant botulism is very rare, it’s best to wait until this milestone is reached according to Health Canada. Coconut oil, which is also used in this recipe on the other hand, has had rave reviews lately about the health benefits for adults and children alike. Coconut oil is easily digested and a great source of fuel for your baby. It contains medium chain fatty acids which are often used in the formulas provided in hospitals for babies. Another great source of medium chain fatty acids is breast milk. Breast milk is rich in Lauric acid, the same fatty acid found in coconut oil and both provide the benefit of easily digestible nourishment, and immunity against infection. For more info. check out Homemade Baby Food Recipes’ website. Pre-heat oven to 350 degrees and line 2 baking sheets with oven safe parchment paper. Combine rolled oats, flour, baking soda, salt and cinnamon in a large mixing bowl. Add coconut oil into oat mixture and using hands combine well until it reaches a crumbly consistency. Add yogurt, applesauce and honey and mix well with wooden spoon. Fold in blueberries so they are well combined into the dough. Using a tablespoon, form mounds of the dough on the baking sheets. Press them down slightly with your palm so they are more of a flat shape than a ball. Place baking sheets in oven on middle rack and bake for approx. 16 minutes or until cakes are golden brown around the edges. Remove from the oven and transfer cakes to cooling rack to cool completely before serving. Store in an air tight container for up to 4 days, or freeze in freezer bags to use within 3 months. Note: You probably won’t have to freeze any of these because you will find you love them just as much as baby does! They are a great little guilt free treat and perfect alternative to crush that almighty chocolate chip cookie midday craving. Now let’s get a move on Weekend Warrior! That frog’s not going to eat itself!